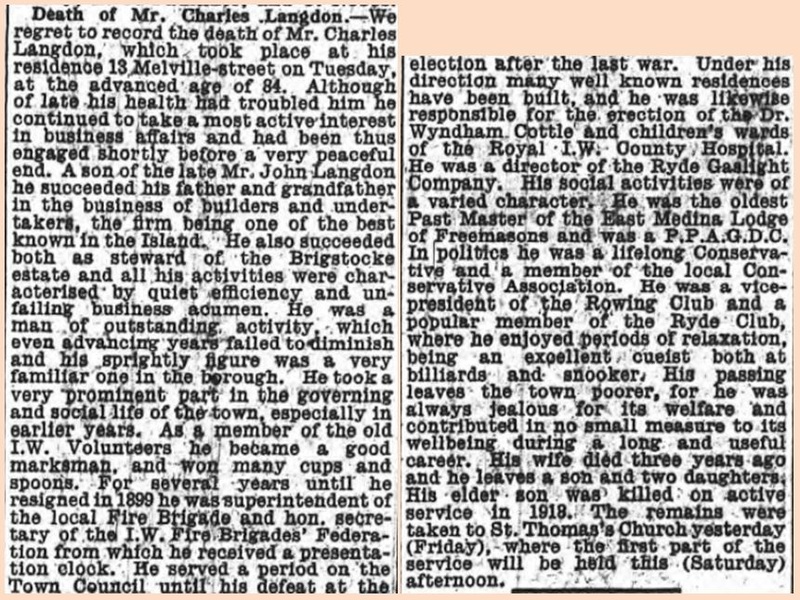 Captain Charles Langdon of Ryde Fire Brigade, the founder of the Isle of Wight Fire Brigades Federation, its first Honorary Secretary and later President, passed away on 25 January 1944 aged 84. 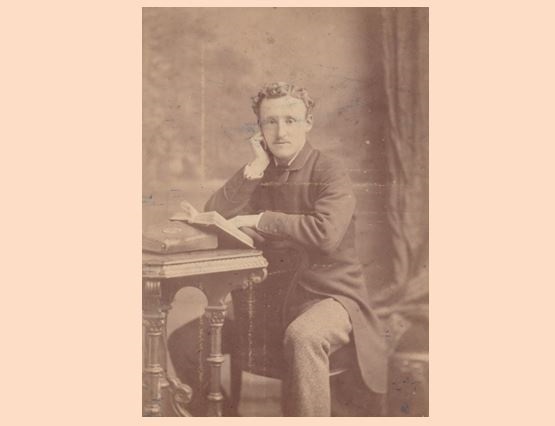 Charles was born in Ryde on 11 May 1859, the son of John and Mary. John was a building contractor who was appointed as Superintendent of Ryde Fire Brigade on 12 January 1864. John's command of the brigade, both in drills and at fires, was unquestionable so perhaps it was due to the burgeoning success and demands on his time of his primary occupation that he resigned his captaincy in 1870. By now the 10 year old Charles would have grown up heavily influenced by his fathers undertakings, in all respects. Charles was the fifth of eleven children the couple raised and the family business had expanded to a substantial 58 employees by the time of the 1871 Census. John suffered a premature death on 13 February 1879 at 51 years of age and the Census of two years later evidences that Charles, aged 21, is heavily involved in the organisation and day to day running of the still successful building business in which the forms submitted state him to be a building employer of other builders. On 26 June 1884 Charles married Annie Jane Newman. They were to rear four children; Ethel born 1886, Florence in 1887, Arthur in 1889 and Percy in 1890. As the end of the decade neared Ryde brigade's incomparable Captain Henry Buckett's health was failing him and he withdrew from the service. On 26 January 1889 the town's Public Works Committee voted on whether to appoint Charles or Mr H. Jenkins to the role. Charles was favoured by seven votes to two and assumed the role immediately. When he attended his first actual fire, at the Pier Hotel on 23 April that year, the IW Observer correspondent remarked how the brigade turned out quicker than they have done for a score of years. The adoption of this attitude and their efficiency was firmly placed at the feet of Charles and won him great admiration. So familiar did he become to the local Press correspondents that he was often referred to as Chas Langdon in their columns. In 1890 his polularity and recognition had won him the approval of Sandown's Captain James Dore and Charles was invited to attend that brigade's annual dinner on 11 March. One of Charles' major efforts was to, successfully, begin to repair the disconnect between the town's fire brigade and police force which had festered bad feeling ever since the infamous case of Dr Hasting's cat of August 1882. From 1890 and for many years after, the town's two services would share an annual dinner or outing to continue the fostering of harmonious relations. In 1891 Charles was invited to Newport Fire Brigade's annual dinner by his counterpart Charles Obsorne. Later the same year Charles extended similar friendliness to the firemen of Ventnor under Captain Frank Rennick for a social meeting and participation in the carnival procession. The Census for the year evidences that the Langdon lived in Player Street. According to the Census returns right back to his childhood Charles had spent his entire life on the same street. In addition to their four children the success of the business is evidenced by the inclusion of a 19 year old domestic servant, Louisa Newbury. By now Charles' work as a commander of firefighters had clearly influenced some of his business decisions and the IW Observer of 28 November 1891 refers to his building of the Brigstocke Almshouses in Player Street, where stone staircases were installed as a fire prevention measure. As the decade proceeded letters of appreciation for Ryde's brigade and that of Captain Langdon began to appear in the newspapers, often for efforts well beyond their normal boundary of responsibility. One thing that Charles had attempted to create for many years was am island-wide fire brigade drill competition, but had been unable to do so as it appears his firemen were reluctant to compete. He also began pushing his councillors for more equipment and whilst they resented the expense, he was successful on some occasions. At Ryde Town Hall on 31 March 1894 Charles gathered several senior officers of other Island brigades for a meeting in connection with the town's carnival. Charles aspired to stage a fire brigade drill competition. At this meeting the Isle of Wight Fire Brigade's Association (changed to Federation in 1897) was born and the competition was planned and successfully staged at Ryde's Simeon Street recreation ground on 6 September the same year. 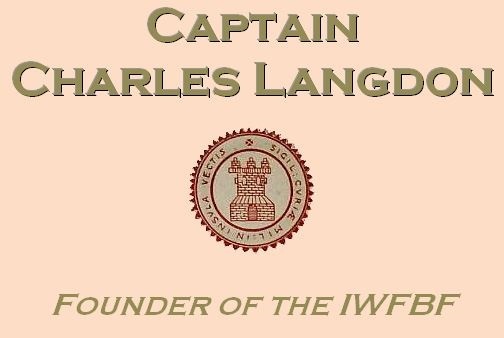 The IW Observer states that the Federation's Honorary Secretary Charles Langdon took the lead in carrying out the arrangements and the venture was considered a resounding success. Charles Langdon, Hon. 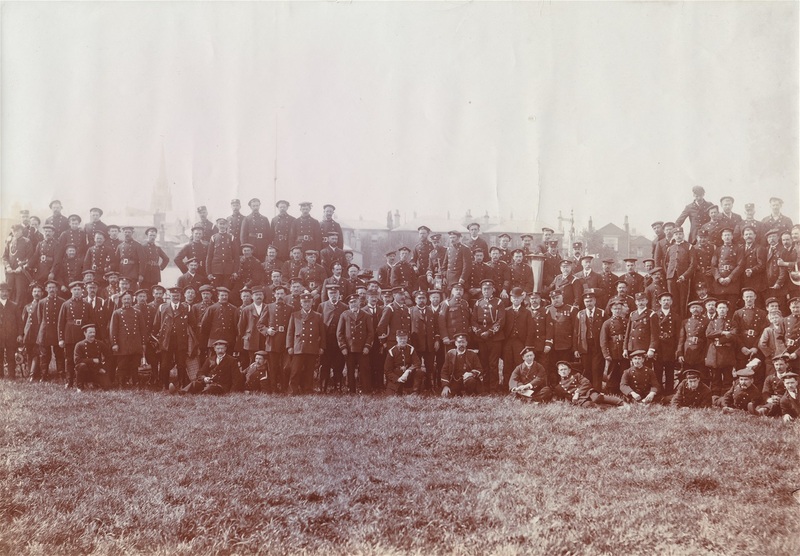 Secretary of the IWFBF, caught in the massed brigades photograph of the 1903 combined NFBU-IWFBF drill competition at Simeon Street recreation ground, Ryde. The full photograph of the NFBU-IWFBF brigades from which Captain Langdon's image was extracted (above). Courtesy of his great grandson David Langdon. Charles was a driven man, committed to his business but equally to the lot of not only his own brigade but that of his colleagues across Vectis. Accordingly he aimed to improve most of all, the capability of his firemen to engage their tasks efficiently, effectively and with suitable equipment at their disposal. However this was to be his undoing. Just nine months after single-handedly creating the Island's first fire brigade competition he resigned from the captaincy of Ryde Fire Brigade after being repeatedly refused the expense of obtaining new hose. Charles' resignation was received by Council on 9 July 1895. The Federation remained under Charles's secretaryship until he resigned in June 1906. Whether or not this was in connection with James Dore and the Sandown brigade's withdrawal due to the Federation not moving with the times isn't known. Tragically his son Arthur Charles was to die in action in Belgium just fifteen days before the end of the First World War. At 29 years of age Arthur was already a senior figure in the family building business and had his own drawing office. When I met Charles's great grandson David Langdon in 2017 he told me a remarkable tale. The tragedy of Arthur's death was deeply felt throughout the family and accordingly his office was locked and the key locked away, never to be opened again. The family honoured those wishes until the last of the generation with living memory of the war passed away in the 1980's. At that stage the office was unlocked for the first time in over sixty years; I could feel the emotion in David's voice as he described that feeling and the discoveries they found within. Charles's connection with the fire brigades and the Federation wasn't over just yet. In April 1929 he contacted the Federation, by then under the chairmanship of Ryde's Chief Officer Henry Jolliffe, and offered to donate and present a silver challenge cup for future IWFBF drill competitions. The Langdon Challenge Cup; the prize for the winners of the Escape Competition from 1929-1939. The IWFBF committee meeting of 5 October 1935 included a decision that Chief Officer Jolliffe of Ryde should contact Charles Langdon to ask him to act as the Federation's President. With no evidence to the contrary it is believed that Charles accepted and remained in that position until his death on 25 January 1944. In the winter of 1945 the Federation held a celebratory dinner at the Metropolitan Hall, Newport, and here, twenty-three months after the death of its creator, the Federation gathered for the final time. His eulogy in the County Press (below) gives more insight to his energetic life and achievements. Rest in peace Captain Langdon.